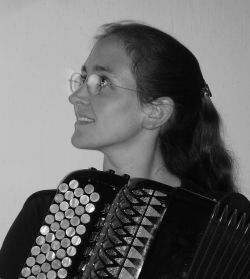 Andrea Carola Kiefer studied accordion with Stefan Hussong (1995–2005) and Elementary Music Pedagogy with Barbara Metzger in Würzburg. After both diplomas of pedagogy and arts, she finished her postgraduate accordion studies receiving the concert diploma. In 2003, she started her doctoral studies at Sibelius Academy with Matti Rantanen affiliated to the DocMus department since spring 2004. Additional studies of contemporary chamber music in Cologne supplement her doctoral programme. She has attended master classes with MieMiki, Hugo Noth, Teodoro Anzellotti, and Joseph Macerollo. 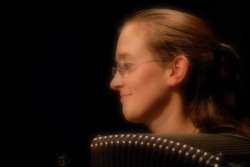 In 2001–2003 she taught accordion at the University of Würzburg. In various competitions, Kiefer has been awarded first and second prizes in solo as well as chamber music category. She received Kulturförderpreis Saar and special prize for interpretation of contemporary music by Saarländischer Rundfunk. She was elected to Yehudi-Menuhin-Foundation LiveMusic Now, awarded a grant by Darmstädter Ferienkurse in 2002 and a 2nd prize at International Wolfgang-Jacobi-Competition in 2003. She was selected for Nachwuchsforum 2004 of German Association of Contemporary Music and received scholarships by the German Academic Exchange Programme DAAD, Suomen Kulttuurirahasto (Finnish Cultural Foundation) and others. In 2010, Kiefer has been awarded the Kulturförderpreis Würzburg. Kiefer concentrates on contemporary solo and chamber music and has performed in ensembles like Das Neue Ensemble (Hannover), ensemble KONTRASTE (Nürnberg), Klangkörper Schweiz, founded Duo AZAK, duoPlus and Ensemble Trialoge. She has appeared at festivals like Dark Music Days Reykjavik, UNM Oslo, World Music Days Luxembourg and Stuttgart, Donaueschinger Musiktage and Schreyahner Herbst. For autumn 2010, she is invited to the Third New Music Week of the Conservatory Shanghai. As a member of Ensemble Tanguedia and as a guest in the Hubert Winter Quartet, she plays music by Astor Piazzolla. In cooperation with composers, she initiated and premiered more than twenty new works. She has recorded for various broadcasting corporations (SR, BR, WDR, DLF, hr, SWR, YLE, arte), radio plays, music for silent movies, and CD productions.